We arrived in room 426 bed B. We were introduced to our nurse, her assistants and all sorts of student doctors. Someone from admitting walked in, making the tiny room seem even tinier. She shoved a clipboard into my hand telling me to sign next to all of the X’s. She then snapped matching hospital bands onto our wrists and nodded at a lady waiting in the hallway. She walked in and introduced herself as a child life specialist. She began to blow bubbles everywhere in an attempt to distract Amaya from the fury of bleeping machines and stark white coats that surrounded us. Dr. C walked in and wanted to hear all about Amaya’s prematurity, pyloric stenosis and Kawasaki’s disease. She was happy to hear that the echocardiogram confirmed that so far, there was no damage to her heart. We went over all of her current symptoms and she began to explain what she thought was going on. This is where it got a little crazy. According to Dr. C, this could be one of three things: Neurogenic diabetes Insipidus/primary polydipsia, a pituitary brain tumor or psychogenic water drinking (basically a form of obsessive compulsive disorder in the form of drinking). Neurogenic Diabetes Insipidus, or DI, is caused by the hypothalamus gland in the brain, not making vasopressin. Vasopressin is an antidiuretic hormone that limits urine output by increasing the concentrating the urine. Basically, without it, a person becomes extremely thirsty. I mean indescribable, fight for your life, thirsty. They drink tons of water and create huge amounts of much diluted pee. This is a vicious cycle that often leaves the person dehydrated. The good news is that most forms of DI can be treated with DDAVP, a synthetic form of the antidiuretic hormone. We’d have to have several tests; including a water deprivation test and MRI scan of her brain to rule out any tumors. If they were negative she may have to be evaluated by a psychologist to see if this was an obsessive compulsive disorder. Amaya was admitted into the Intensive care unit for the 24 hour water deprivation test. The test had to be closely monitored because it could lead to “serious dehydration and a salt imbalance.” I was beginning to wonder if this was a good idea. It seemed like I was putting Amaya into more danger than getting her the help she needed. Dr. C assured me that she would be closely monitoring Amaya and if she lost more than 3% of her body weight or began to show any signs of physical distress, she’d stop the test. The 24 hour test measured the fluid balance between her blood’s ADH level and the concentration ability of her kidneys. Fluids would be restricted. A urine sample would be given as often as she needed to go and blood would need to be drawn every 45 minutes or so for the duration of the test. It was horrible. 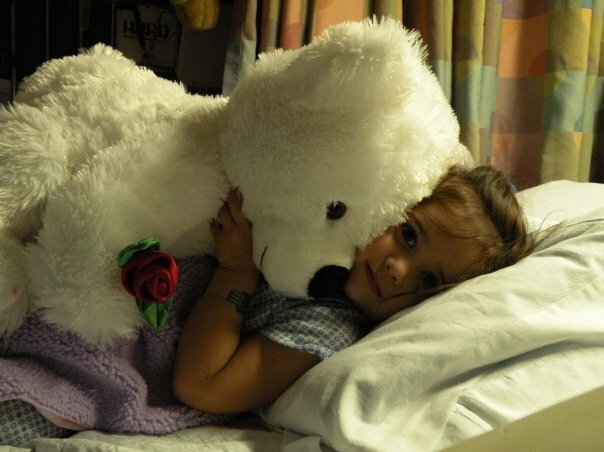 Amaya fought the nurses and doctors with everything she had. At one point she screamed so loudly and for so long that she passed out. It actually made it easier because they could draw the blood and be done, but it was tortuous. It was like every time she finally calmed down from the previous blood draw, they’d be back for more. They tried squirting some mild sedative up her nose that was supposed to knock her out for about 10 minutes but it didn’t work. Amaya had so much fight in her and was sick and tired of being poked. I couldn’t blame her. It broke my heart to have to help the nurses pin her down with giant eyes looking at me saying, “Why are you letting them hurt me like this?” Oh, my poor sweet baby. I’m so sorry. At one point, Amaya wouldn’t even allow me to touch her. She was afraid I was going to assist in holding her down. She was curled up in the fetal position, slowly rocking herself and repeating, “I’m thirsty, I wanna go home. I’m thirsty, I wanna go home.” I wasn’t sure just how much more any of us could take. Finally, the test came to an end after just twelve hours and the doctors allowed her to eat as many popsicles as she wanted. Once Amaya was observed for a few hours, we went back to our original room. Dr. C came in and explained that we’d begin treating Amaya with DDAVP which is a synthetic hormone that acts like the human antidiuretic hormone. It should suppress her thirst and things would start getting back to normal. We would stay at the hospital for another twenty-four hours to observe her on the meds. Dr. C also noted that Amaya’s MRI results came back normal. There wasn’t a brain tumor. Praise the Lord! The medication seemed to work. After just one dose, Amaya slept through the night, not waking to drink or to go potty. She hadn’t done that in months. We were all super excited! We were discharged that day. The first week home seemed okay. Amaya was constantly complaining of being tired, but I figured that was to be expected after spending time in the hospital. She was still complaining of headaches, but not nearly as often as before. The weekend I let Amaya go over to my sister’s house to watch a movie. It’d give me a couple of hours to get caught up with chores and laundry. About an hour after I dropped her off my sister called to tell me that Amaya was crying, complaining of another headache and that she wanted to come home. 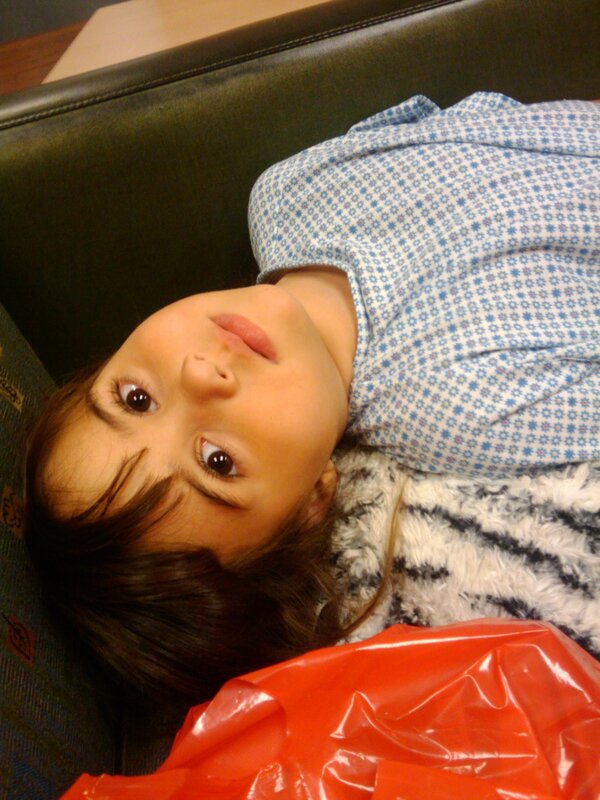 Amaya looked exhausted. I brought her home and put her to bed. Sophia and Josiah were playing quietly and I was out front watering the yard. Amaya came screaming out of the house, “I HAVE A HEADACHE!” She was cradling her head with her hands, barely able to even hold it up. She was wobbly, dazed and confused. I scooped her up, took her back into the house and saw that she had vomited all over the bed. Was this the flu or related to everything else? She didn’t have a fever. I paged the endocrinologist on call and he suspected it was water intoxication. Water intoxication happens when way too much water is being consumed and not enough urine is being made. This is very dangerous and can be fatal. The symptoms usually start with nausea, vomiting, headache, confusion and muscle weakness. As it escalates, it can lead to seizures, brain swelling and death. What they think happened with Amaya was that she consumed too many fluids while taking DDAVP. The medication stopped her kidneys ability to make urine, but it didn’t take away her thirst. This was a very dangerous boat to be in. The doctors cut her dosage in half and we were sent home to try again. It was going to be a long road but I had no idea how long it was actually going to get. 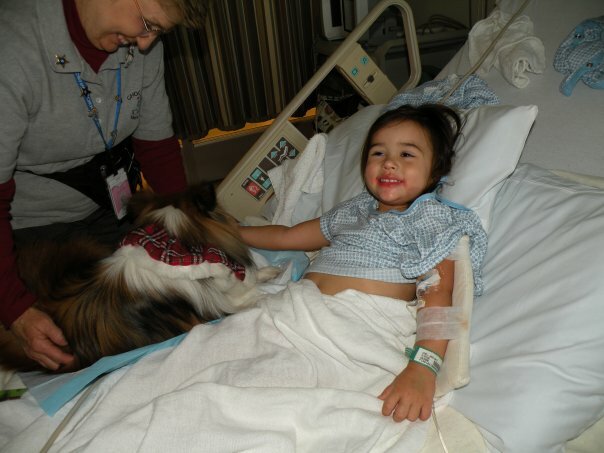 This entry was posted in childhood, Health, Illness, Mystery Diagnosis, Therapy Dogs, Uncategorized, Water Intoxication, wellness and tagged children, Faith, family, fever, healing, hospital, illness, strength, support, therapy dog. Bookmark the permalink. there was a 17 year old football player that died from water intoxification. he had drank 2 gallons of water and 2 gallons of gatorade before practice a couple weeks ago. he passed out, was taken to the hospital, ended up in ICU on life support. his parents had to make that awful decision to take him off and he died shortly after. i’m glad that you were able to catch this and was able to get help for your adorable little girl! Wow! That’s so sad Jenny. Most people are unaware that you can die from water…it really needs to be made known! Im so sad for that family.